The target of this research area is to develop dramatically the study of water-containing minerals and magmas of the Earth under high-pressure and high-temperature conditions using neutron scattering. Although these water-containing materials play very important role in various phenomena inside the Earth, little is known on its properties from the materials science point of view. First step of this project is to construct a new beam line dedicated to this project at J-PARC, a newly constructed pulsed-neutron source at Tokai-mura, Ibaraki. Two organizations, Japan Atomic Energy Agency (JAEA) and High Energy Accelerator Research Organization (KEK) worked jointly to construct this new neutron source and the operation has started in 2008. Then we are going to construct and install a newly designed high-pressure and high-temperature apparatus for neutron experiments to this beam line. Using these new facilities, we will study the hydrous minerals and magmas under pressure to promote our understanding of the role of water in the deep part of the Earth. The research techniques thus developed will further contribute to the materials science as well. This research project will be conducted by the collaboration of three groups; Coordination Committee, Experimental group, and Theoretical group. 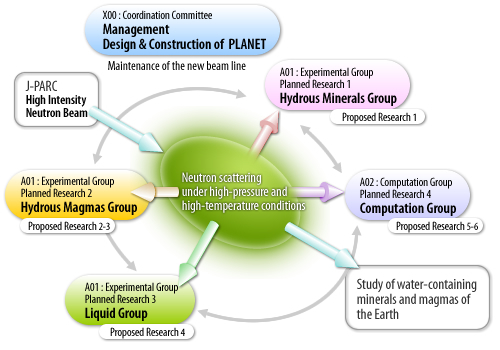 The experimental group consists of three sub-groups; Hydrous Mineral group, Hydrous Magmas group, and Liquid group. These, in total, five groups will make close collaborations as described schematically in the following figure. This committee consists of two teams. One is responsible for the management of the entire project and takes care of the whole schedule, meetings and exchange of information. The other is responsible for the design, construction, and maintenance of the new beam line and high-pressure apparatus constructed at J-PARC. All the experimental studies using the new neutron beam line at J-PARC will be conducted by this group. In order to study hydrous minerals and magmas, two sub groups, Hydrous Minerals group and Hydrous Magmas group, will work on these materials respectively. Hydrous magmas are, however, very complicated material and various technical difficulties exist in experiments and in analysis. In order to solve these problems, we have also made Liquid group, which will focus on water and other simple liquid under pressure and will develop various experiment techniques. Recently, quantum simulation became a very powerful tool to predict the structure and property of hydrous minerals, magmas, and water under pressure. This computation group will play a very important role in this research project to assist the experimental groups in selecting proper materials for experiments and in analyzing the data obtained by the experiments.